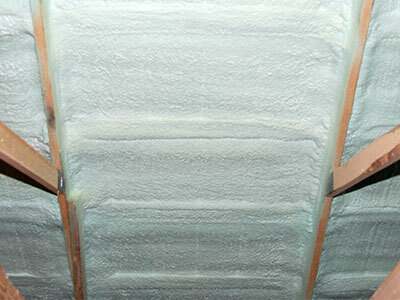 Closed cell spray foam has the highest R-Value of any type of insulation on the market. Its R-Value can range from 5-7.5~ per inch. Like most spray foams, this is only one part of the value that is added by using a closed cell spray foam. The most important value added is the ability to be an air barrier. The Department of Energy reports that 30% of heating and cooling costs come from poorly sealed homes. In colder climates where vapor barriers are more important, closed cell spray foam is a perfect fit. In as little as 1.5 inches, closed cell spray foam can be a vapor barrier. While closed cell spray foam is not as effective as a sound barrier as open cell spray foam, it does stop air flow which can reduce dust and pollen from entering your home. 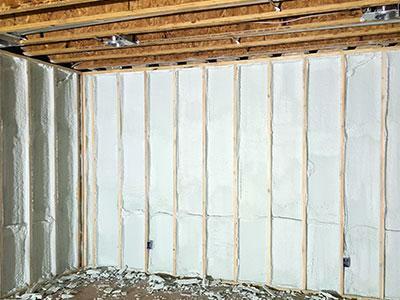 Closed cell spray foam is a good fit in walls, attic spaces, pole barns, and basements. Basements are a great place for closed cell spray foam insulation and is where closed cell spray foam really shines. Because it is a vapor barrier and moisture-resistant, it is a perfect choice to spray on concrete or masonry walls. Using standard fiberglass insulation on a concrete or masonry wall is a poor choice as the concrete wicks water into the fiberglass, causing it to mold leading to some serious health problems. In general, using closed cell spray foam in a high-moisture area is a great idea. Closed cell spray foam is moisture-resistant and can handle damp areas like crawl spaces, livestock buildings, vehicle wash bays, and many other harsh locations. Some advocates of closed cell spray foam push the product s a structural material. However, we caution people as it can add racking strength to walls but it is not intended or designed to be used as a structural material. Unlike traditional insulations, closed cell spray foam does not need to be installed at 12-14~ inches thick. Most applications only require 2~ inches. At 2~ inches of thickness, closed cell spray foam can stop 94.4% of heat transfer. Copyright © 2018 KC Spray Foam & Coatings, LLC. All rights reserved.